The overall goal of treatment in our office is to reduce the length of time that your child will have their braces on. We pride ourselves on having the shortest treatment times possible and you will find that we are able to complete your child’s orthodontic correction much faster than what is commonly anticipated. A critical part of achieving this goal is proper timing in placing their braces. Our Pre-Orthodontics Guidance Program allows us to time their treatment so that they will have their braces on the shortest amount of time possible to achieve a beautiful result and wise investment. The Pre-Orthodontics Guidance Program, or “Dr. B’s Buzz Club”, includes all of the examinations, the necessary radiographs to assess growth and development and skeletal jaw balance, and any indicated prescriptions regarding the possible removal of baby or permanent teeth. The fee for this program will be applied to the future active treatment – there is no additional charge for this service. Burleson Orthodontics takes pride in completing your child’s treatment on time and in having the shortest overall treatment times. In fact, many of our patients find that their braces can be removed earlier than expected. The key is treatment timing, which Dr. Burleson takes very seriously. We will treat your child like we would treat our own family members, with ultimate respect for your time. Is Your Child You A New Patient? Your child’s first appointment is scheduled following your initial phone call to our office. Following this phone call, a packet of information will be sent to you with information about our office and the examination appointment. A health history form and map will be enclosed. During the first appointment, several important things will happen. You will be greeted by the treatment coordinator. She will review your child’s personal information, health history, and your chief concerns with your child’s teeth and/or smile. One of our specialists will conduct a thorough examination of your child’s face, mouth, teeth, and jaws to determine whether they can benefit from orthodontic treatment and, if so when treatment should begin. We will answer as many questions as possible. We have a state-of-the-art computer program that can simulate and demonstrate many things about orthodontic treatment. 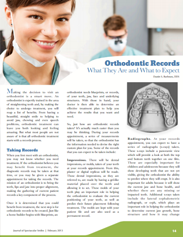 If orthodontic treatment is recommended now, we may proceed and take diagnostic records. 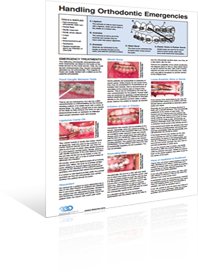 To discover the step-by-step process for orthodontic records, please download the report, “Orthodontic Records: What They Are And What To Expect“.